Edward Zammit Lewis has defended his successor’s decision to reform Air Malta before finding a strategic partner, describing it “a different way of looking at a complex issue”. The former tourism minister insisted the restructuring being undertaken by Konrad Mizzi was a continuation of the process begun in the previous four years. He was asked about Air Malta at a Labour Party press conference to mark the government’s first 100 days in office. 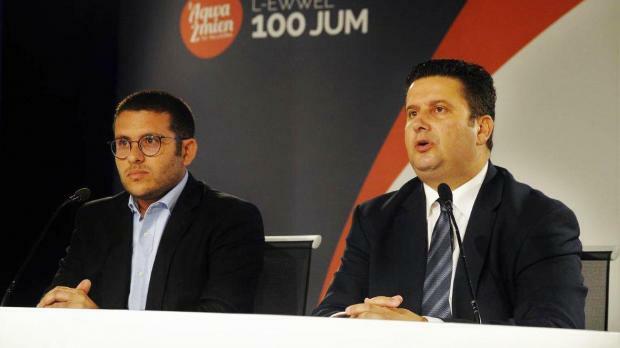 “During the first phase we had reviewed all commercial contracts to make savings and the restructuring process has to continue to make sure the airline is profitable ,” Dr Zammit Lewis said when asked whether the post-election policy change was a sign of distrust in his running of Air Malta. After the election, Dr Mizzi was given the tourism portfolio that included Air Malta. In his first comments, he outlined the government’s priority to put the airline on sound financial footing before seeking a strategic partner. Last January, the government dropped talks with Alitalia over a possible partnership following months of negotiations that were held under a cloud of financial uncertainty hounding the Italian carrier. Dr Zammit Lewis said the minister had his full support, when asked whether he endorsed Dr Mizzi’s threat to Air Malta workers that he would close down the airline if they remained intransigent on change. “Konrad Mizzi is doing very well and he was being factual in his words. What he said was obvious because if we do nothing the airline will not survive but it has to be noted that a Labour government created Air Malta and never axed workers,” Dr Zammit Lewis said. The former minister was flanked by PL president Daniel Micallef, who said the government had achieved a lot in its first three months in office. Mr Micallef said the pace of change was breathtaking, which had its flip side because people were inundated with information that made it difficult for them to keep up with new measures that were being taken. Mr Micallef said that recent statistics showing that people at risk-of-poverty and social exclusion dropped were positive but the government would not be burying its head in the sand.